Mikayla is a huge Winnie the Pooh fan so I get the pleasure of watching that lovable old bear fairly often. The latest Winnie the Pooh movie was released last year. It is a very cute movie and well worth watching especially if you have little ones. The main plot (though there are several other plots throughout) is that Eeyore has lost his tail and everyone must help him find a new one. 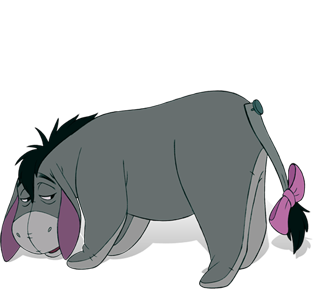 Eeyore is quite depressed through the whole ordeal – which is really nothing new for Eeyore. They try just about everything imaginable from a coo-coo clock to a yo-yo and even an anchor and can’t find a suitable replacement tail. In the end, Pooh finds Eeyore’s original tail. Owl had been using it as a bell ringer without realizing it already belonged to someone. Christopher Robin uses a nail and hammer to reattach the tail to Eeyore – which seems harsh, but we’ll just go with it. Eeyore tries it out to make sure it will work properly and notes that it swishes well and the bow is nice – all while remaining somewhat depressed. He did want his tail back, and he’s glad to have it reattached. But, he’s not happy. He’s still as depressed as ever. And Pooh loves him just the same. Children have this unique ability to love unconditionally, without judgement or fear. Somewhere along the way we tend to lose that gift. When our friends don’t act or feel the way we are comfortable with, we aren’t sure how to treat them. As a result, those who may act or feel differently than the norm try to hide or disguise the way they feel rather than being honest about it. I hope I can be like Eeyore, honest and truthful about who I am and how I feel. And I hope I can be like Pooh, loving others just as they are.